We are owners and operators of a range of commercial web sites and were major web and commercial database designers who have now all retired. We still own and operate was the “British Towns and Villages Network. This site has in excess of 1.8Million pages of information, which are a guide of places to visit, events to attend, how to get there and a selection of Hotel and other accommodation in which to stay. 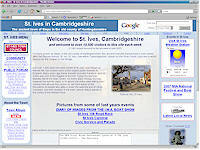 We also own and operate web sites about the major towns of Huntingdonshire; St. Neots, Huntingdon, St. Ives, Ramsey and Godmanchester, and to them we have added 50 more local websites covering all the larger villages and parishes of the district. Jevstar Dot Com has also designed, built and managed enterprise level systems for Exel Logistics and Somerfield Stores Ltd; to name but a few significant organisations. We have also undertaken “health system projects” for Private Health Care Providers.